Apple's iOS might be first to support an augmented reality contact lens system currently in development at EP Global Communications, as the two companies are scheduled to meet next week to discuss potential platform integrations. EPGL's smart contact lens proof of concept. According to a tweet posted to EPGL's official Twitter account late last month, the firm is slated to meet with Apple on Sept. 13 "to explore use of iOS for mobile in future augmented reality lenses." EPGL has not yet settled on a single mobile operating system to pair with its AR contact lens project, the company clarified in a statement to AppleInsider . "We are having an introductory conversation with Apple about the iOS platform, being the chosen platform for our augmented lens development program," said Michael Hayes, President, EP Global Communications. "We anticipate that our augmented lenses will communicate with smart phone applications for display, so we must explore platforms that we can become compatible with. iOS is obviously one of the platforms we are keenly interested in." While Hayes stressed EPGL is strictly in the preliminary stages of sounding out potential mobile OS integrations, the company's AR contact lens system —to which iOS devices might one day connect —appears to be advancing through the development process at a more rapid pace. 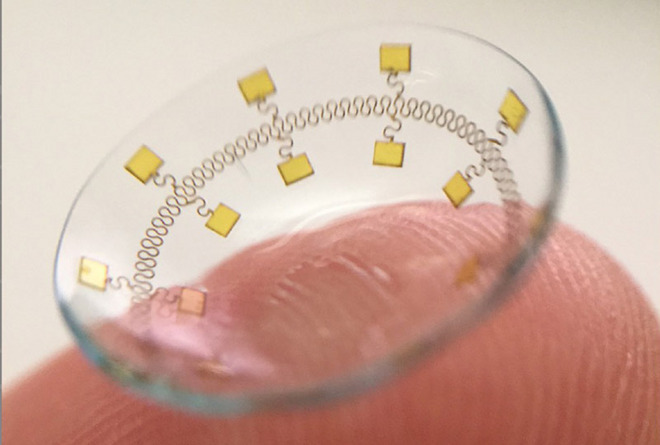 Evidenced in the photo above, EPGL has demonstrated the viability of integrating electronic circuitry into a silicone hydrogel contact lens, the first step toward projecting computer generated graphics into a user's field of vision. Further, the firm has a number of granted and pending patents in the "smart contact lenses" and "augmented vision" fields. Last month, EPGL received its first U.S. patent grant for a "System for Contact Lens Wireless Communication," which details a method of connecting a pair of contact lenses with a host device using wireless technology. A separate piece of recently allowed IP describes a "Smart Storage Case" that acts as a liquid charging dock for future lenses. In addition to AR graphics and data display via onboard flexible circuitry, EPGL is investigating methods of harvesting energy generated by the blink of an eye and installing autofocus mechanisms and sensors directly into silicone hydrogel substrates, among other cutting-edge technologies, according to documents seen by AppleInsider. EPGL's smart contact lens technology, which started life as a now-defunct partnership with CooperVision, has drawn interest from industry heavyweights. In April, Johnson & Johnson Vision Care, known for its Acuvue contact lens product line, won first rights to negotiate a purchase of pending EPGL technologies. EPGL is expected to elaborate on potential Apple device support at its Smart Vision Conference 2016 on Sept. 23. Some technology industry watchers believe virtual reality/augmented reality is the logical evolution of mobile computing. VR headsets, which transport users to a space a wholly created by a computer, has been around for years, while practical AR systems are a more recent development. Unlike VR, AR tech usually employs projectors or transparent displays to overlay data onto real world objects. With product offerings like Oculus Rift and HTC's Vive, VR is slowly catching on with the gaming set, but a clear path to AR has been more elusive. Tech titan Google dabbled with a simplified form of AR —technically a wearable heads-up display —in Google Glass, while Microsoft went a step further with its HoloLens project. Shadowy startup Magic Leap promises to combine VR and AR to create a completely new experience called merged reality, though public showings of the technology has been limited to flashy hands-off demonstrations. Apple, too, has shown interest in AR/VR solutions, and holds a number of patents covering both software and hardware implementations. Most recently, the iPhone maker patented technology that provides for enhanced visual navigation using iPhone's camera and onboard sensor suite. Apple CEO Tim Cook last month confirmed the company's stance on AR, saying Apple is investing heavily in the fledgling market sector.